Pro Life Women's Centers: A Safety Net for Babies and Families presentation, Monday, May 6th at 7:00 pm at Our Mother of Good Counsel Parish, 16043 S. Bell Rd, Homer Glen, is sponsored by the Multi-Parish Respect Life Ministries. This will be presented by Peg Brunk – The Women’s Centers of Greater Chicagoland, Mary Griffith – Waterleaf, and Kelley Seifert – Aid for Women. These three centers in the Chicago area are helping to save lives and support young families. Come find out about the mission and programs of these pro-life organizations who help to prevent abortions, but also provide counseling, care and assistance to women and families both during and after pregnancy. Join the St. Francis of Assisi Golf League. We will be playing at Rolling Hill (Silver Lakes C.C.) on Monday mornings from May 13th - August 26th (No league play on Memorial Day). Greens fee: $14 walking; $25 riding per week. Tee times starting at 7:30 am (sign up each week for the next week). The league fee for the season is $45 due at the time of registration. This fee includes ending lunch, prizes and computer record for each week's score (Pro Shop). Registration can be done in the office, by phone 460-0042 or online. Companions of Your Journey – Self-Paced At-Home Retreat, Tuesday, April 28 Orientation Gathering at 7:00 pm in the Great Room. Offers a way to grow in awareness of self, others, the world and God. Ask yourself: Who am I at this moment? What am I busy with? How can I get in touch with my true self? Where do I find God in my daily life? This free self-paced retreat gives you a chance to nourish your heart and soul, to find spiritual energy and more meaning in your life, and to see where you are on your journey with God. To learn more and/or register. 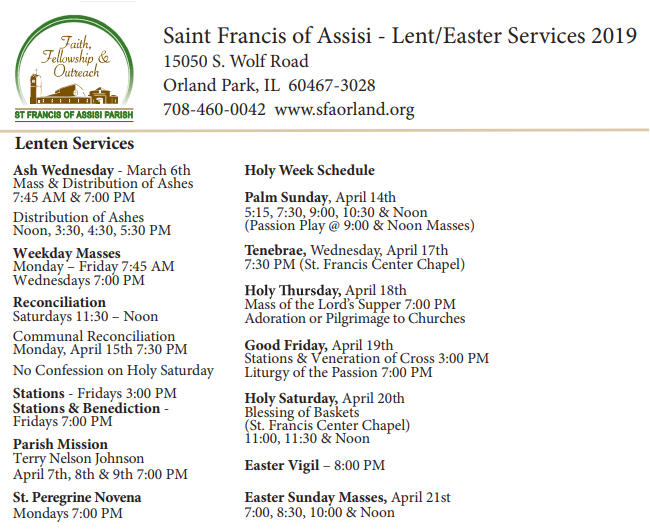 All are welcome at St. Francis. No matter where you are on your faith journey, we are here to walk with you. We invite you to join us at mass. Come and feel the warmth of our community. 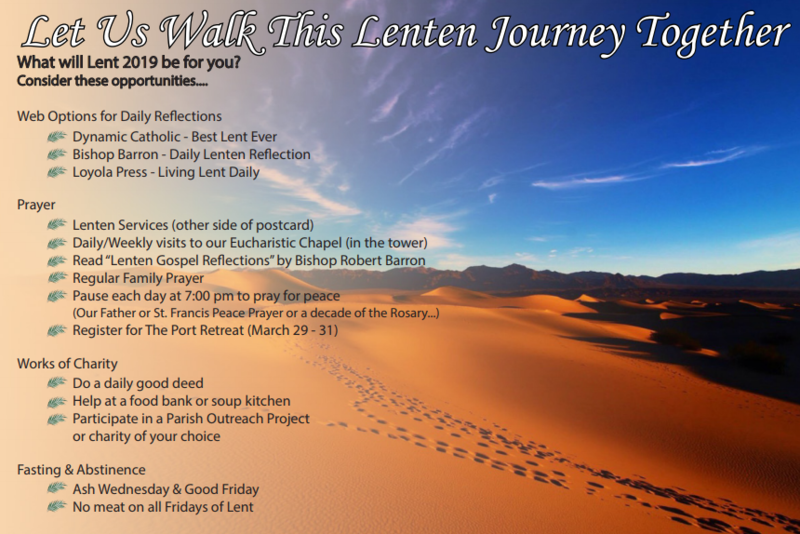 If you would like to learn more about the Catholic faith, have questions or already have decided you would like to become Catholic, please contact the parish office to set up a time to speak to a member of our pastoral staff. The life and vitality of St. Francis of Assisi thrives on the commitment of the many people involved in the various ministries of the parish. Currently, we have over 30 committees and ministries for all ages. We encourage you to consider participation in one or more of these areas.